Pear Tree Cottage: All Change in the Greenhouse!! All Change in the Greenhouse!! A Saturday without glacial temperatures or rain!! Instead, spring arrived and not a moment too soon. 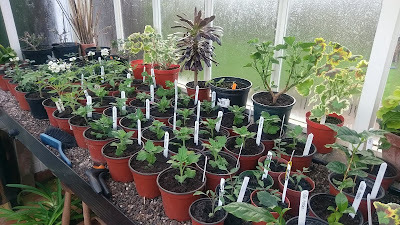 Although very late, it was a good time to move out the biggest winter hibernators from the greenhouse before the inside temperatures start to rise and give overwintering plants too much of a shock in the outside world. Out came the Oleanders and the lemon tree leaving the need for much reorganisation in their wake. It's that brief in between time when the big things are out and the babies are all most definitely in. In this case, the babies are Nemesias, Antirrhinums, Tomatoes, Gazanias, Chrysanthemums, Chillies, Geraniums (of all types and ages!). In the cold frames are Lilies-ofothe-Valley, Heleniums and some Geneva Mallows of differing varieties. Next job is to prepare tomato beds and secure a cane framework for their supports. Who knows? 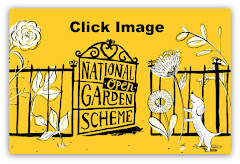 With some really settled spring weather later this week, we may even get some vegetables sown and planted and borders weeded!